Am I the only who has thought the current situation with TNA wrestling might be the one thing that makes WWE whole again? When work broke that James Storm was at an NXT taping and performed in a WWE ring, it was the shock heard around wrestling circles. A TNA star – without a contract, mind you – wrestles for Vince McMahon, and gets away with it. Oh, how times have changed. There was a time very recently where the thought of a performer from the “little promotion” making the jump to the McMahon circus was unheard of. That TNA stars were not wanted, like they were an illness or worse, they could be better than the talent roster from which the creative team could choose from. The fact Storm left NXT without a contract and appears to be in the middle of the Hatfields and McCoys over where he will hang his hat in 2015, and given the fact other TNA stars have been rumored to look for other work outside the Tennessee based company tells me and many wrestling fans, the invasion of TNA talent might be as far off as well thought it could be. And if that is the case, who’s next to walk into NXT and showoff for the crowds in attendance? Can I get a Bobby Roode from the audience, please? It started with Samoa Joe, but that is not where it should end. Roode, a TNA original, is one wrestler who would fit right into the mid card and work his way toward the main event. And remember as well, Jeff Hardy has already been rumored to be coming back to his original stomping grounds after the first of the year. And invasion, no. A definite infusion, yes. As Aaron Sass of inquisitr.com explained in his story, Samoa Joe opened this door when he signed his contact to wrestle in NXT. For several years, WWE chairman Vince McMahon has been almost dead-set on not bringing guys into WWE who were major names in TNA. Sure, there have been exceptions, but almost every exception has been someone who has worked for WWE, and been a big name for them in the past: guys like Jeff Hardy, Rhyno, Rob Van Dam, and the Dudley Boyz. 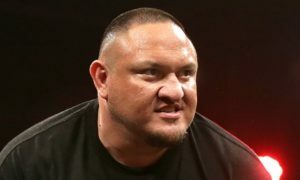 When longtime TNA star Samoa Joe became a free agent earlier this year, many were hoping that he’d end up in WWE. However, it seemed like a long shot due to Vince McMahon’s bias towards the brand’s major stars. But, this past May, Joe ended up in NXT, and immediately challenged Kevin Owens for the NXT Championship. The fact Joe has not made the September call-up yet from the minors has me a bit perplexed since others like Owens, Sami Zayn and Neville have found success on the top shelf. Finn Bailor figures to be the next in line. If WWE is going to secure talent from other promotions, most notably TNA, Roode should be free agent No. 1 on the list. McMahon might also kick the tires on AJ Styles and maybe take a look to see if Drew Galloway wants to be more than “The Chosen” one as he was once portrayed by the boss, only to be squashed into the lower mid-card. The move isn’t just limited to the men in the audience either, because having Gail Kim back on the roster only accentuates the potential of the Divas Division. What I would not give to see Becky Lynch and Kim or Sasha Banks and Kim or Charlotte and Paige and Kim in an “Iron Man” match. See, this is the WWE we all should want and get to know. This is what WCW should have been when the McMahon’s bought the company. Options are a great thing. McMahon could have them, if he takes a step forward. We shall see if other TNA stars take a shot at going to Orlando and showing what they are made of. WE shall see if McMahon and WWE officials extend any other offers to Roode or anyone else. In the meantime, we all can wish – and hope McMahon does the right thing to save his WWE.